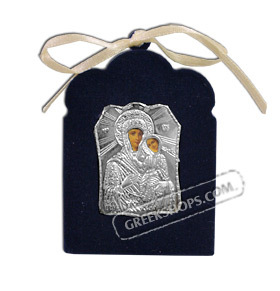 Sterling Silver (950 Stamp) icon of Panayia ( Virgin Mary ) on a blue velvet covered wooden frame. The velvet-textured icon frame has a hook attached to the back, allowing it to be hung on a wall. The Virgin Mary is the mother of Jesus Christ and the most highly honored and beloved saint. She has four names in the Greek Orthodox church: Theotokos (Mother of God), Panayia (All Holy), Aiparthenos (Ever Virgin), and Despina (Our Lady). August 15 is one of the most important church holidays.